You have not experienced North Myrtle Beach peace and tranquility until you spend a North Myrtle Beach vacation at Windemere residing in a three-bedroom, two-bath or four-bedroom, three-bath North Myrtle Beach condominium that comfortably sleep up to 11 people. This oceanfront North Myrtle Beach resort is close to all the North Myrtle Beach, South Carolina attractions. The charm and serenity of this North Myrtle Beach vacation destination is incomparable. 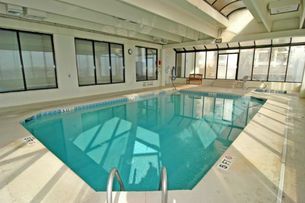 The swimming pool and hot tub are indoors at Windemere North Myrtle Beach resort. Sleep peacefully in the comfort that these multi-bedroom North Myrtle Beach condos provide. Beautiful décor, soothing colors and innovative layout combine to give you a terrific North Myrtle Beach vacation destination. Get in a brisk walk on the beachfront early in the morning then take a dip in the Windemere swimming pool. Grab your beach towel and make your way to the family friendly beach in the Ocean Drive section of North Myrtle Beach, South Carolina. The fishing pier is close to this North Myrtle Beach resort, if any member of your family wants to see if they can reel in the catch of the day. For a relaxing day at the beach, just bring along your favorite book and collection of sand toys for all day North Myrtle Beach fun. As you are sure to discover, the scent of North Myrtle Beach seafood always seems to waft through the air, reminding you of the restaurants and buffets that are prepared to satisfy your shrimp and fish cravings. Kids love the themed restaurants found throughout North Myrtle Beach and there are several waterfront restaurants that offer glorious views of the ocean, inlet or Intracoastal Waterway. Seemingly as prevalent as all the North Myrtle Beach restaurants are the North Myrtle Beach golf courses. With about 100 golf courses in the Myrtle Beach, South Carolina area, you are only a few minutes away from teeing off in beautiful surroundings during your North Myrtle Beach vacation. Elliott Beach Rentals is not affiliated with onsite management or the HOA of Windemere.